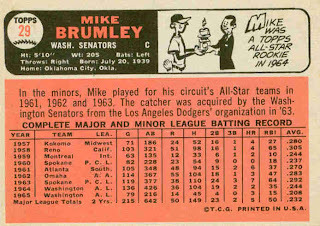 This is the last of Mike Brumley's three cards (#29). He was on the Senators Rookies card in the 1964 set (one of Lou Piniella's many rookie cards! 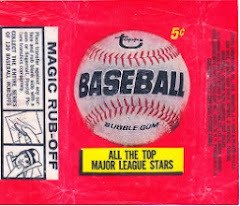 ), and also had a card in the 1965 set. 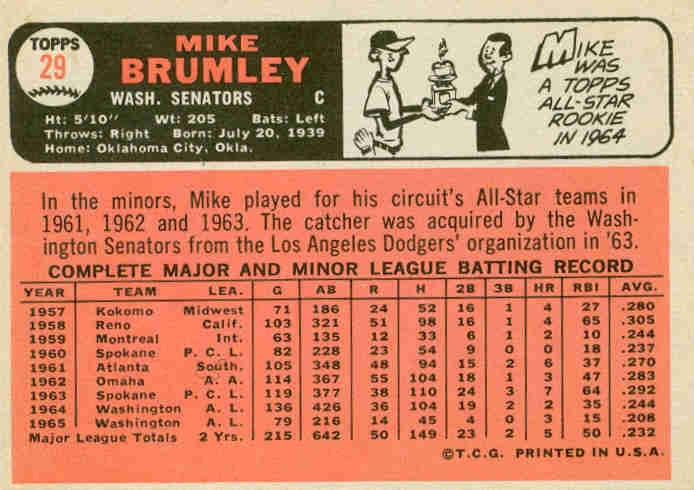 Brumley was signed by the Brooklyn Dodgers in 1957, and played for 7 seasons in their farm system, before he was purchased by the Senators in October 1963. Mike was Washington's starting catcher as a rookie, catching 132 games (112 as the starter) and was named the Topps all-rookie catcher for 1964. Unfortunately for Mike, the Senators purchased another catcher from the Dodgers after the 1964 season (Doug Camilli), and they shared the catching assignments in 1965. Veteran infielder Don Zimmer also caught a few dozen games that season. Still another catcher (Paul Casanova) joined the team in 1966, and that was the end for Brumley. He spent most of the season at triple-A Hawaii (not a bad place to be exiled to! ), and played a few games with Washington. Mike missed the '67 and '68 seasons, and played for the Astros' triple-A Oklahoma City team in 1969 and 1970. His son Mike Brumley Jr was an infielder for several teams in the early 1990s. 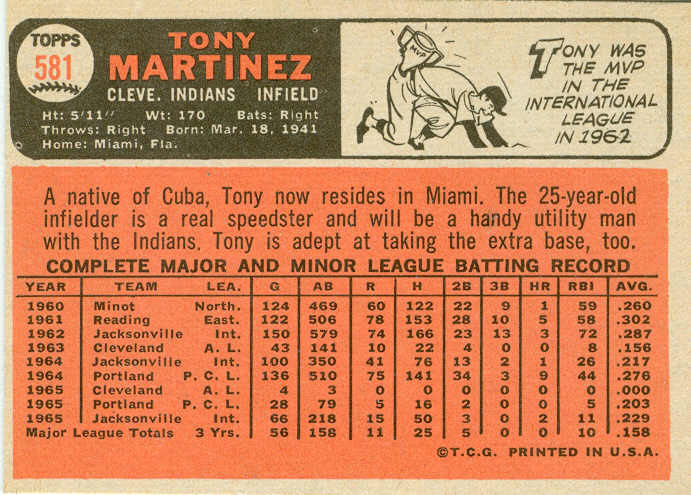 This is Tony Martinez' last baseball card (#581). 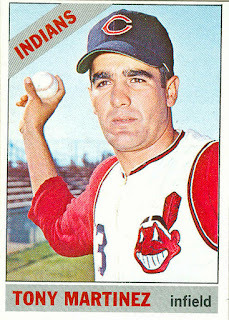 He also appeared on a 1963 Rookies card, and as an Indian in the 1964 set. 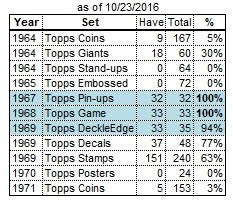 Tony was primarily a shortstop, playing less than 5% of his major and minor league games at 2nd base. 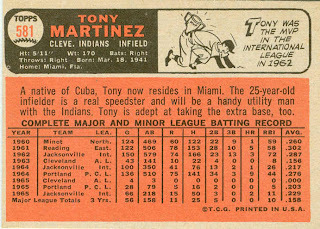 Martinez was signed by the Indians in 1960, and played shortstop for various teams in their farm system from 1960 to 1965. 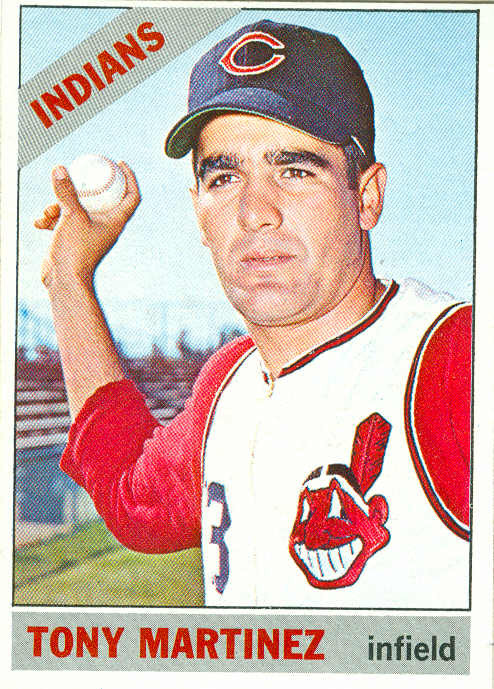 He also played 43 games with Cleveland in 1963, and fewer than a dozen games in each of 1964 and 1965. 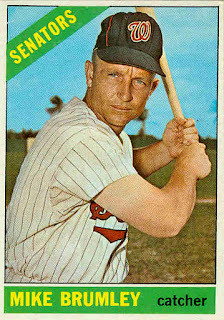 Also in '65, he played for the Cardinals' triple-A team in Jacksonville, although it appears that he was still property of the Indians. Tony made the Indians team at the start of 1966, but only played in 17 games, the last on June 14th. Two days later, he was sold to the Cardinals, who assigned him to triple-A Tulsa for the remainder of the season. He would never return to the big leagues. On April 1, 1967, Tony was bundled with pitcher Art Mahaffey and 2nd baseman Jerry Buchek, and shipped off to the Mets for veteran shortstop Ed Bressoud and outfielder Dan Napolean. 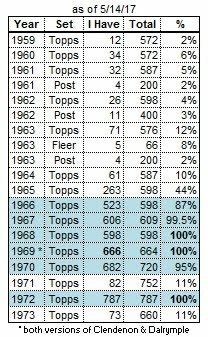 Martinez spent 1967 and 1968 in the minors, although he only played in 24 games combined for those last 2 seasons. 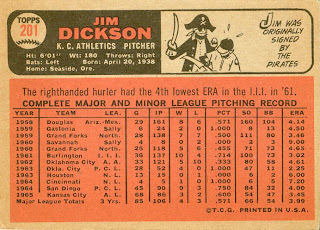 This is Jim Dickson's final card (#201). He previously appeared on the 1964 Reds Rookies and 1965 Athletics Rookies cards. 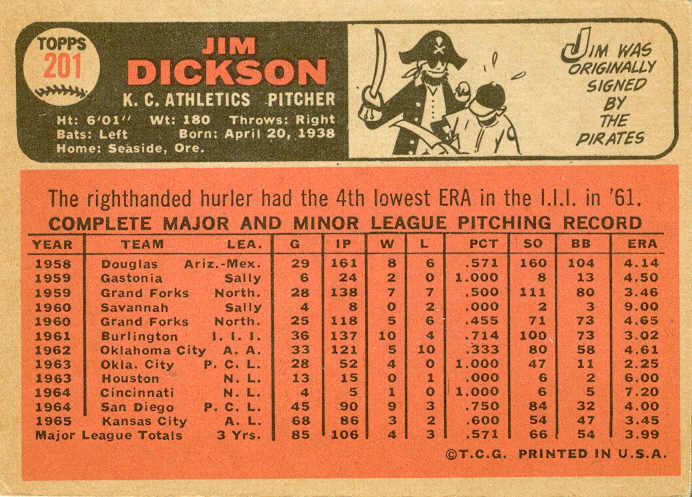 Jim was signed by the Pirates in 1958, and spent 4 seasons in the low minors as a starter and reliever. After the 1961 season, he was selected by the expansion Houston Colt .45s in the minor-league draft. Dickson pitched all of 1962 and the first half on 1963 with the Colt 45s' triple-A team in Oklahoma City. He made his major-league debut with Houston on July 2nd, and appeared in 13 games for the Colt 45s, all as a reliever. Prior to the 1964 season, Jim was traded to the Reds for shortstop (and future Red Sox' manager) Eddie Kasko. Dickson only got into 4 games for the Reds that year, spending most of the season with the Reds' AAA San Diego team. In November 1964, he was selected by the Athletics in the Rule 5 draft. This required him to stay on the major-league roster for the entire season. (1965 would be his only full season in the majors.) He pitched 85 innings in 68 games, both high points of his short career. The 1966 season would be his last in the big leagues. 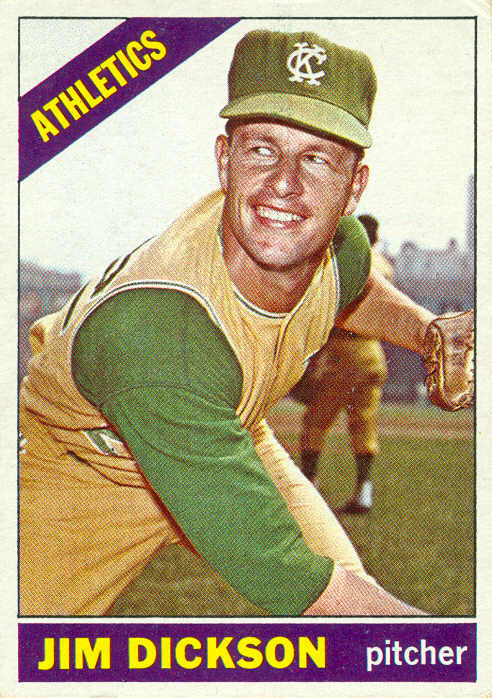 He made his final appearance for the Athletics on July 24th, and spent the remainder of the 1966 season, as well as the 1967-70 seasons in the minors. 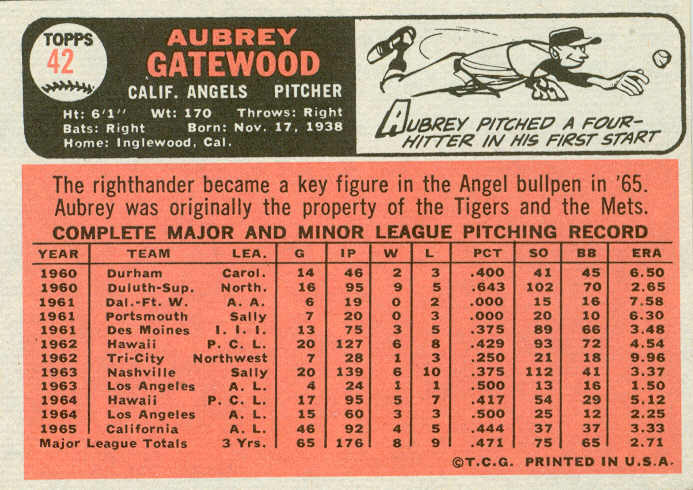 Aubrey Gatewood (#42) had a brief career in the mid-1960s with the Angels. Signed by the Tigers in 1959, he was selected by the Angels in the December 1960 expansion draft. 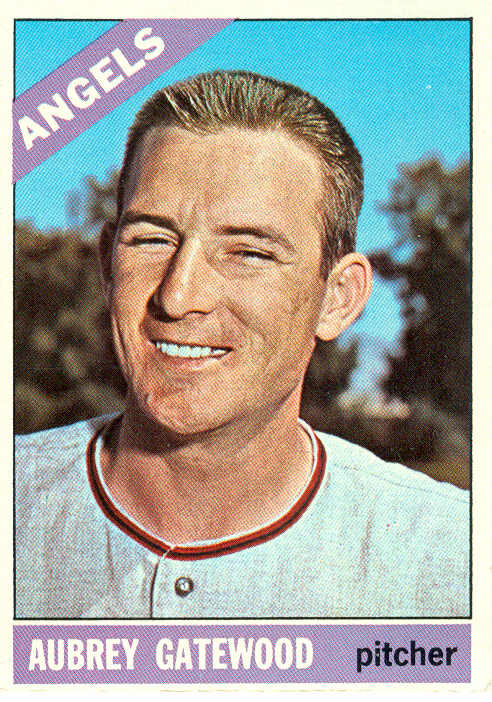 After one season on the Angels' farm, Aubrey was selected by the expansion Mets in the Rule 5 draft, but returned to the Angels before the start of the 1962 season. Gatewood made his major-league debut with the Angels in September 1963, starting 3 of his 4 games that month. The following season, he made 17 starts for triple-A Hawaii, along with 7 starts and 8 relief appearances for Los Angeles. 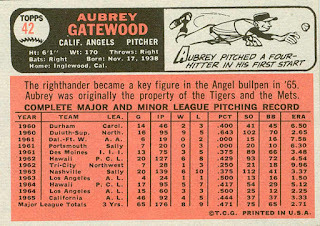 Aubrey spent the entire 1965 season with the (now California) Angels, working primarily out of the bullpen that season. Unfortunately, he walked just as many as he struck out (37). He spent the next 6 years in the minors (although pitching 2 innings for the Atlanta Braves in 1970), playing for 7 different organizations before retiring.